Delegates to the California Democratic Party Conventions from this County are comprised not only of those elected by the Mariposa County Democratic Central Committee, MCDCC, but we also can vote to elect representatives from State Assembly District 5 or ADEM representatives. See details in the graphic above. This election cycle Kim Monson from the MCDCC is running and would appreciate your vote. To vote, you must be registered as a Democrat in AD 05. To see a list of those running and their qualifications, click here and then select Assembly District 05. Les Francis Presentation of Survey Results on January 9th. Les Francis from Sierra Forward will be presenting the results of the survey discussed below, and his thoughts about the 2020 election at a special Central Committee Meeting on January 9th at 4 pm at the Miners’ Roadhouse. The Mariposa County Democratic Central Committee has enjoyed a strong relationship with Sierra Forward, a political organization dedicated to supporting the right person to represent our district in the House of Representatives. In this last election, after the California Democratic Party endorsed Jessica Morse, Sierra Forward supported her candidacy to represent California CD 04. One of the efforts that Sierra Forward sponsored was a series of surveys over the last few years to judge the political temperature of the district and how ready it might be to elect someone other than Tom McClintock who has not been seriously challenged since being elected to this seat in 2008. Unfortunately, Jessica did not win in 2018, but she came much closed to defeating McClintock than any other Democratic Candidate. To understand this election result Sierra Forward commissioned a post election survey. Below is the results of that survey as reported on the Sierra Forward Facebook page. Recall that, in 2016, McClintock’s margin of victory was 25.4% (62.7% to 37.3%), whereas his margin this year was only 8.4%. That is a difference—or “swing” of 17 percentage points, and therefore one of the largest swings from “red” to “blue” in the country! Jessica ran well ahead of the entire Democratic ticket across the district, in some instances by 8 points or more And voter turnout was nothing short of amazing! So far (and with counting still going on), total votes cast were 334,491, or 72.7% of those registered to vote. In the last midterm (2014), turnout was only 52%. Have no doubt, all that canvassing, phone banking, post cards, texting, all those parties and the hours of hard work clearly paid off! Believing that it was important to understand what happened and why, Sierra Forward commissioned a post-election survey of people who actually voted in the 4 th CD this year. Conducted between November 7 and November 19, the survey revealed some important data, information that will help guide our efforts over the next two years, and which should help whoever chooses to run in the 4 th CD in 2020. * Input from friends, neighbors, colleagues, etc., via conversations and/or social media, was critically important in voters’ decisions as to whom to vote for. Sierra Forward is here to stay. Stay tuned for our plans to continue to work for positive change in the 4 th CD and beyond. Your continued interest and support is essential to those plans. Thank you!!! Click here are some key talking points on the various Propositions on the 2018 ballot prepared for the California Democratic Party by communications specialist Isaac Wright of the Forward Solution Strategy Group and tailored specifically for our rural communities. Note that the California Democratic Party had not taken a position on Proposition 3, the water bond. Morse-McClintock Debate Coming to Mariposa Soon! A Mariposa Gazette spokesperson confirmed the debate between Jessica Morse and Tom McClintock will be ‪on Sunday, Sept 23rd, at 2:00 p.m.‬, in the Mariposa High School Auditorium. As part of the agreement with the candidates, each campaign will receive 25% or approximately 100 seats each of the total (400) seat tickets. The remaining seating process distribution (200 seats?) by the Gazette was still being decided. 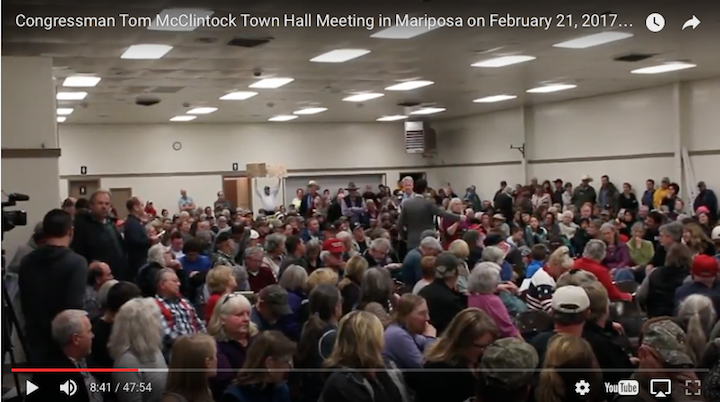 The Mariposa Gazette goal is to limit their part of the seat distribution to Mariposa County residents because the auditorium can only hold about 400. Questions for the candidates can be mailed or emailed to Greg Little, Editor, Mariposa Gazette. To get tickets, email mariposagazette@mariposagazette.com - , put Debate Tickets in the subject box, then give your contact information, including address, phone, and email.. Say you want two tickets (the max they'll give). It's a lottery, so good luck all. The Executive Board of the California Democratic Party met in Oakland in July, with 4 people from Mariposa County in attendance. KDL, as he is commonly known, is seen above speaking at the Environmental Caucus where is a particular favorite based on his strong support for environmental and climate change issues as a member of the State Senate. The other significant event from that meeting was the fact that the Party has decided to hire staff for the first time dedicated to outreach to rural communities. See other pictures from that meeting here. 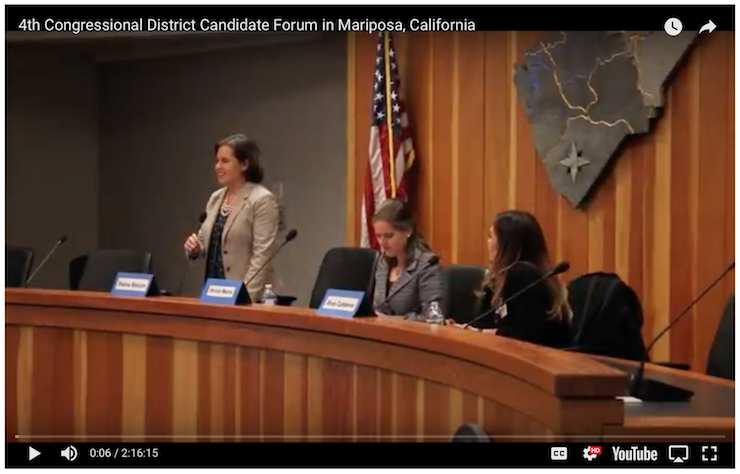 A political debate for the three candidates running for the Mariposa County District 3 supervisor position is just two weeks away. The event is being hosted by the Mariposa Gazette as well as KRYZ Radio in Mariposa. It will begin at 6 p.m., Thursday, April 26 at McCay Hall in Catheys Valley. It will feature incumbent Marshall Long and challengers Heather Berkinoff and Jerry Cox. It will last approximately an hour and a half. As part of the process, the newspaper is seeking questions for the candidates from our readers. The Gazette will consider all questions submitted and the newspaper will make the final determination as to which questions will be asked during the debate. To submit questions, send them to greg@mariposagazette. com. Questions can also be dropped off at our office at 5108 Highway 140, Suite B in Mariposa. To mail in questions, send them to Candidate Questions, c/o Mariposa Gazette, P.O. Box 38, Mariposa, CA 95338. All questions will be kept confidential by the newspaper and candidates will hear them for the first time when they are asked at the event. The debate will be moderated by Little and all candidates will be given equal time to respond. Each candidate will be allowed to give an opening statement and then questions will be asked by the moderator for the remainder of the debate. The questions will be rotated between candidates during the debate. The debate will be broadcast live on KRYZ Radio. Several Mariposa Democrats traveled to Fresno to join others at Fresno High School in support of the March for our Lives movement. About 1,000 people carrying signs gathered on the front lawn of the high school to listen to impassioned students and community leaders speak about the need to pass national comprehensive gun laws. Democratic Congressional Candidate (CD22) Andrew Janz and a representative of Senator Kamala Harris spoke in support of gun controls and universal background checks. After the speeches, the crowd marched around the campus, waving signs and acknowledging the honks and cheers from passing cars. The weather cooperated and it turned out to be a beautiful day for a march. The California Democratic Party held its annual convention February 23-25th in San Diego. 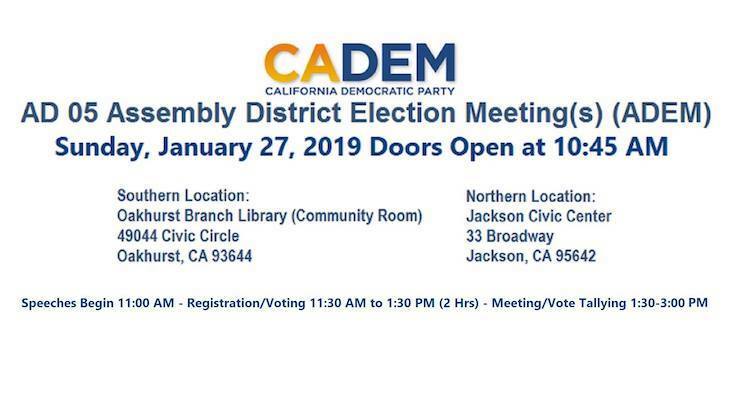 One of the key Democratic Party events that happen in election years is the official California Democratic Party Endorsement process. Although several Democrats can run in a given race in the California "Top Two" primary, only one candidate can be officially endorsed in that race by the State Democratic Party. 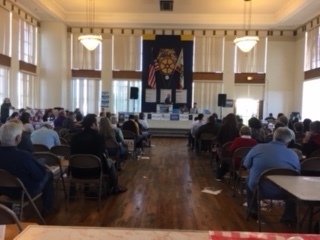 As reported earlier, on January 28th, there was a pre endorsement conference in Modesto where all members of the County Central Committees and representatives from Democratic Clubs voted on who should get the State Party endorsement. Tom Pratt (SD 08) and Carla Jean Neal (AD 05) received more than the required 70% of the vote and thus won the endorsement of the State Party. However, in the heavily contested CD 04 race to unseat Tom Mc Clintock, no candidate received the necessary 70% of the vote, but since one candidate, Morse received more than 50%, the race went to the convention for a decision. At the convention in San Diego, it was the convention delegates from the various central committees and ADEM delegates from CD 04 that voted on the endorsement. The Mariposa Democratic Central Committee was represented by their elected delegates, Christina Oborn, Aaron Marcus and Steve and Rosemarie Smallcombe. Kim Monson was also elected as a delegate, but after the deadline for attending this convention as a delegate. She attended as an observer. Lowell Young, also from Mariposa, attended and voted as an ADEM representative from AD 05. Saturday and the Endorsement Caucus On Saturday as the 4 o'clock hour of the vote approached, there was excitement in the air and the Bateson, Calderon and Morse campaigns all had supporters with T-shirts and signs outside the room where the vote would take place. Heavy campaigning was happening; supporters chanted their candidate's name. They held up campaign signs while others tried to engage delegates in discussing the merits of their candidate. To receive their ballots, delegates had to line up and show their credentials at a table outside the voting room and then enter the voting room with the ballot box. All three candidates gave a short pitch and then the voting took place, although in this case most delegates had put their ballots in the ballot box as they entered the room. After a motion was made to close the voting process, one of the officials running the endorsement process read off the names of all of the delegates eligible to vote in this race and another announced how that person voted, and a third recorded the vote tally on a flip chart. The room was tense, however, it soon became clear fairly quickly that Jessica Morse was building a big lead. The question then was would she receive the necessary 60% to win the recommended endorsement and be placed on the consent calendar for approval on the convention floor on Sunday morning. 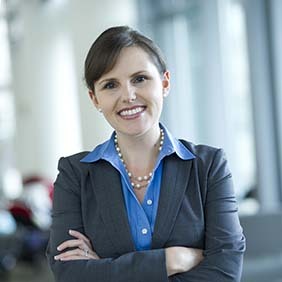 As can be seen in the photo above, Jessica Morse received 66% of the vote and her name was added to the consent calendar as the recommended endorsement of the California Democratic Party. And, as learned later, one Jessica supporter, after he picked up his ballot, went to the wrong room to vote and didn't realize it until the voting ended, too late to have it counted. His vote was not counted. If it had been, Jessica would have had the 66.666667 or two-thirds of the vote necessary to make the endorsement challenge-proof. Sunday at the General Session At the General Session of the California Democratic Party (CDP) convention on Sunday, the results of the balloting for the various state Democratic endorsements were placed on Sunday's General Session consent calendar for approval. 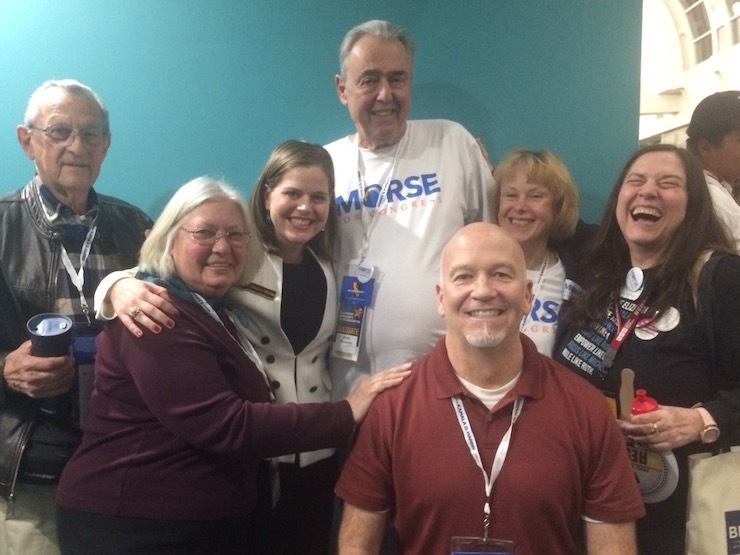 That calendar reflected that delegates from CD 04 had recommended Jessica Morse for endorsement by the CDP. CD 04 delegates however, learned that the two other CD4 candidates had together tried to gather 300 signatures by the 11 pm Saturday night deadline to challenge the CD 04 endorsement vote. If successful, this would have caused the challenge to be debated and voted on at the General Session on Sunday. It was reported that the required number of signatures were not submitted on time, and those that were, were not on the required form, and therefore, the challenge failed. It was also reported that there was a "surprise" floor action planned for the Sunday general session to overturn the endorsement recommendation. When the time came for delegates at the General Session to consider recommendations for state and federal offices, the first item was a "successful" challenge to the CD 45 recommended endorsement of David Min. Min had received the necessary 60% of delegate votes from his district and the endorsement was placed on the consent calendar but with a + notation indicating that his opponents had raised the 300 signatures and submitted them on time to challenge the results of the CD 45 delegates' votes. This meant that the recommended endorsement would go to the floor of the general assembly for the more than 2,800 delegates from all over the State to decide the outcome. The challengers said that Min was too moderate, and they wanted one of the other more progressive candidates to represent them in the election. Three people for each side spoke for 1 minute each. The last speaker in favor of rejecting the challenge was Betty Yee. She said that Orange County was diverse community and that Min best represents that community. She went on to say that Min received 64% of the vote in the pre-endorsement conference and the required 60% in the convention endorsement vote. On that basis, Democrats should respect the CD 45 delegates' endorsement recommendation. When Chair Baumann called the General Assembly to vote, the challenge was soundly defeated. At that point, as we understand it, there were supporters from all three CD 04 candidates gathered around the floor microphone used for the challenges and someone, we understand from another CD, tried to challenge their CD's results without having the necessary signatures. The chair said that no challenge without the necessary signatures turned in on time would be considered. When they protested, the chair asked the delegates on the floor if they wanted to consider a matter that the bylaws say they can't consider, and the crowd loudly supported him with a voice vote, "No! ", on the issue. That was the end of all attempts to challenge endorsement results. The point is that the challenge system works. There was a "successful" challenge to the CD 45 endorsement, meaning the 300 necessary signatures were gathered and turned in on time, and the matter was brought to the floor of the General Session. All the delegates got lots of emails Saturday evening and Sunday morning from the challengers. Glossy handouts in support of the challengers were on every one of the 3000 seats in the hall on Sunday morning. But the challenge was soundly defeated on the floor because the vast majority of delegates in the General Session felt that it was up to the delegates from the CD in question to determine their endorsed candidate, not the delegates statewide. CD 45 was a much closer situation because the one vote needed to get Min to 60.00% was a provisional ballot. But that challenge failed and there is no doubt that a CD 04 challenge would have been defeated on the floor even if the challengers managed to get the necessary 300 signatures submitted on time. Jessica had votes to spare; she received 44 votes, vs. 13 for Regina and 4 for Roza. "The party in Region 4 will lend its every available resource to these endorsed candidates, with the primary goal of winning back the Congressional House in targeted seats, as well as CA state legislative seats currently held by Republicans. There will be a coordinated campaign in both the Sierra foothills and the upper Central Valley region. Candidates up and down the ticket will work together with volunteers and party leaders to leverage resources, and provide financial, and organizing support. All endorsed candidates will receive support, volunteers, and strategic coordination from local and state party leaders, and in some cases federal partners such as the DCCC." This California Democratic Party endorsement substantially increases the Morse campaign's credibility with donors and allows third party organizations like Sierra Forward, which remained neutral before the endorsement process to take a position and support the endorsed candidate. While before the convention, the various delegates from Mariposa were split on who to support, we all came to the conclusion that Jessica would be the strongest candidate, and are all solidly behind our State Party Endorsed Candidate, Jessica Morse! Over the last few months various Candidates have visited our Central Committee and Club Meetings, giving us a chance to learn about their positions on the issues that are important to our County. One of the races that is of critical importance is CD 04, the U.S. Congressional seat currently held by ultra conservative Republican Tom McClintock. A "bio" of McClintock has been compiled by Sierra Forward and is available here. Mariposa County is represented at the State level by Senate District 8, where Republican Tom Berryhill is termed out, and Assembly District 5, which is currently held by Frank Bigelow. CD04 has been a particularly hotly contested race where three Democratic women, shown above, are vying to replace Tom McClintock, in what was once considered a safe Republican seat and in the past, McClintock has outraised his opponents by large margins. Not so this year, with two of the Democratic challengers outraising him and one, Jessica Morse, with more cash on hand than McClintock at the end of December. Rep. Tom McClintock, the Northern California Republican whose district was recently added to Democrats' list of vulnerable California seats, was outraised by two Democratic challengers last quarter. McClintock, of Elk Grove, raised $215,854 between Oct. 1 and Dec. 31, less than the $260,724 Regina Bateson reported raising and significantly lower than Jessica Morse's $291,761 haul. The incumbent was already raising money at a faster clip than previous cycles, bringing in $651,168 in 2017 as opposed to the $523,986 he had raised in 2015. Morse now has more cash in the bank than McClintock, with $488,842 reported as of the end of the year compared with his $461,943. Morse, who previously worked on national security issues for the federal government, also raised more than McClintock in the previous quarter and had already been gaining on him in cash on hand. Bateson, a political science professor and former foreign service officer, is further behind with $276,060 in the bank. 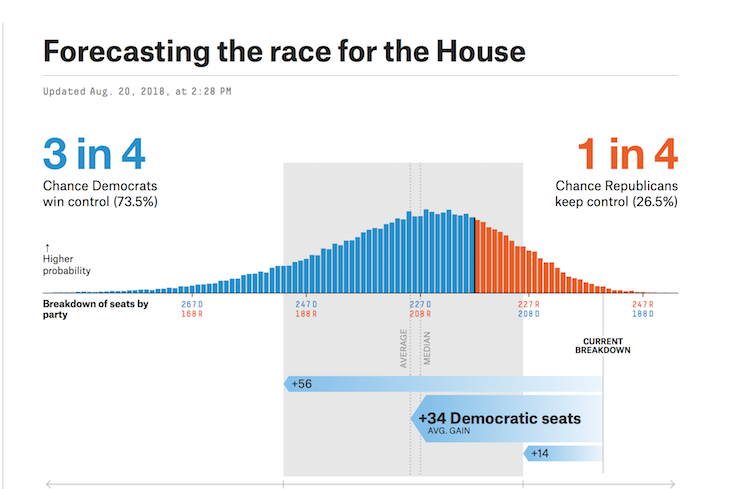 The numbers could hint at trouble ahead for the five-term Republican, who is facing his first competitive race since first being elected in 2008. His district was named a Democratic priority in November. On January 28th, Region 4 of the California State Democratic Party met in Modesto to hold a pre endorsement conference. Any candidate for office that received more than 70% of the eligible votes at this conference would automatically be endorsed by the California State Democratic Party for that office. 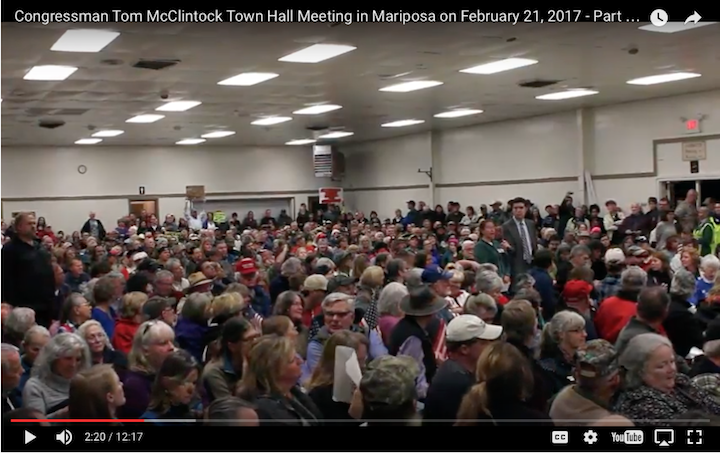 Those eligible to vote from Mariposa County included members of Democratic Central Committee and three members of the Mariposa Democratic Club which had voted to endorse Jessica Morse for the CD 04 race at their January meeting. Those from Mariposa also were able to vote on the SD 08 and AD 05 races. Tom Pratt (SD 08) and Carla Jean Neal (AD 05) received more than 70% of the vote and thus won the endorsement of the State Party. In the CD 04 race however, no candidate received more than 70% of the vote, so the endorsement for this race, if any, will be decided at the State Party Convention on February 23-25th. Voters in our 4th Congressional district will have a chance to meet another candidate on Sunday, June 25. Regina (Gina) Bateson will speak that evening from 6 to 8 pm at the Best Western Conference Room, at the intersection of Hwy 140 and 49S. Coffee and water will be served. This is a free event and the public is invited to attend. After earning her BA in History at Stanford and MA and PhD in Political Science at Yale she worked as a foreign service officer for the US State Dept and was posted in Central America. 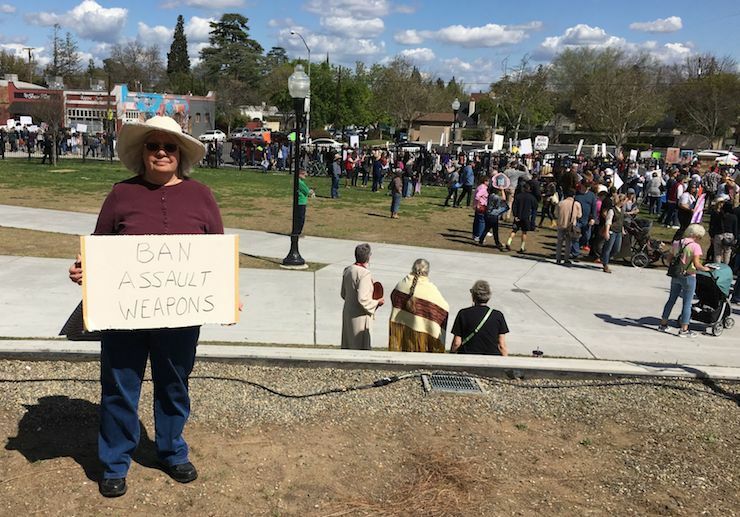 As a native of Northern California she became concerned about the congressional representation and decided to return to her hometown and do something about it. Bateson considers herself a pragmatic problem-solver who is committed to improving life in our region, from the suburbs to the Sierras. “I invite all our district’s Democrats, moderate Republicans, and unaffiliated voters to join me in this campaign. We may not always agree on everything, but I will listen carefully to your views, and I will treat all the residents of our district with dignity and respect. You deserve no less.” says Bateson. The conference room is located at the north end, next to the swimming pool. For overflow parking, please part next door at the real estate office and walk to the room. This event is being sponsored by the Mariposa Democratic Club and the Mariposa County Democratic Central Committee. 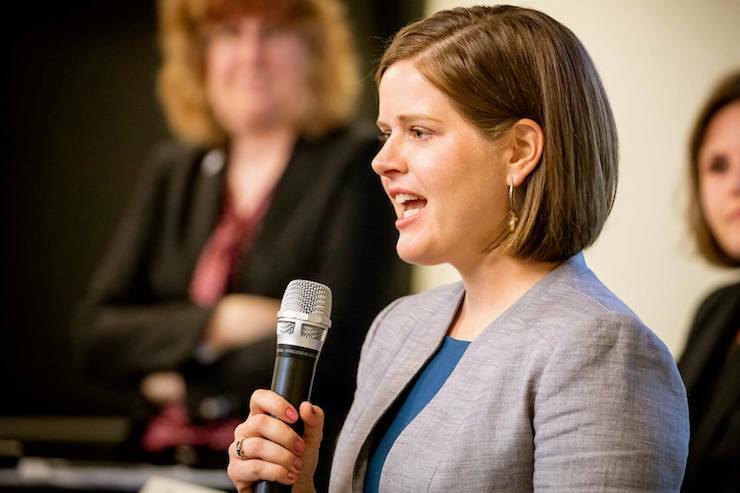 Jessica Morse, one of the Democratic canidates for California CD 4, currently held by Tom McClintock, to speak to Mariposa Democratic Club and Democratic Central Committee on June 10th. Read her amazing biography on the club website here. The Central Committee meets right after the Mariposa Democratic Club meeting. "The President's proposal takes a wrecking ball to California, particularly its most vulnerable citizens, seniors, immigrants, and the middle class. Gutting Meals on Wheels, Medicaid, childhood nutrition programs, college loan programs, and disability benefits, while putting billions into the construction of a border wall makes no sense from either a human or a budgetary perspective. The Trump budget blasts holes in California's safety net and state budget, and I am confident Democrats in our Congressional delegation will fight to block this budget and work to pass one which reflects the values of the American people." Statement of California Democratic Party Chairman John Burton on "Trumpcare" Vote: As Congress considers repealing the Affordable Care Act, a law that has provided health insurance to more than 4 million Californians, our state’s representatives should know that they are on notice. They can either stand with the people who sent them to Washington D.C. and protect health care for the sick and vulnerable and those who need it most, or we will hold them accountable on Election Day. The Mariposa County Democratic Central Committee (MCDCC) represents the Democratic Party in Mariposa County. The MCDCC operates under its own by-laws, the California State Elections Code and the by-laws of the California State Democratic Party. 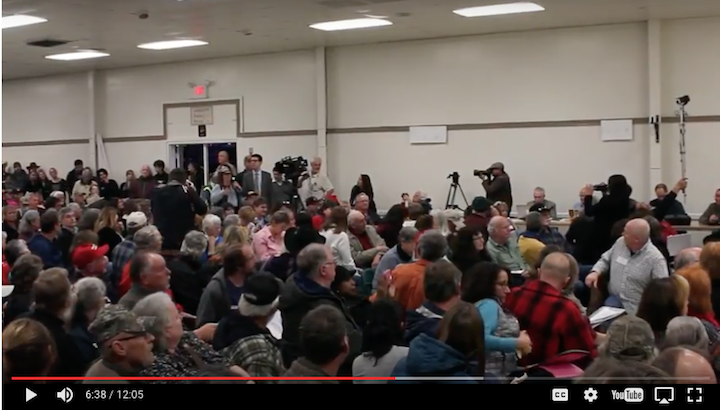 In the pictures above (from video taken by the Sierra Sun Times) MCDCC Chair, Christina Oborn, Lisa Edelheit and Mary Wood, District 1 members, questioned CA CD 04 Representative Tom McClintock at the February town hall meeting in Mariposa. Christina asked what Republicans during the last eight years did beside obstruct constructive legislation, contributing to the divisiveness of the electorate. Lisa was concerned about the future of public schools and Mary's question about what plans the Representative had for assuring she would have affordable healthcare after the Republicans repealed the Affordable Care Act, made the national news. The MCDCC held its reorganizational meeting in January, 2017, with election of officers and appointment of delegates. Many members participated in the Women’s March in Sacramento, Oakland, San Francisco and San Jose on January 21. Heartened by the huge response to the March and the meteoric rise of the Indivisible movement nationwide, many MCDCC and Democratic Club members attended meetings of quickly forming local progressive action groups and found much in common. Three groups (Mariposa Action, Progressive Mariposa and Next Step) were invited to speak to the Democratic Club and to meet with the MCDCC to discuss collaboration. During the February meeting, MCDCC members unanimously voted to collaborate on resources and activities in the service of shared goals. The current focus of the Central Committee is on voter outreach and plans for supporting Democrats running for public office. The MCDCC would encourage anyone that is registered as a Democrat in Mariposa County to consider becoming a member of the Committee or we would love to talk with you about other ways you can help grow the Democratic Party in Mariposa County. We have room for more members who live in County Supervisor Districts 2, 4 and 5, or you can serve as and alternate member if you live in Districts 1 and 3. if you want to help us elect Democrats and spread awareness of Democratic issues, let us know! If you are interested, contact our Chair, Christina Oborn, at mcdemcc@gmail.com. The Mariposa County Democratic Central Committee charters the Mariposa Democratic Club and is responsible for chartering other clubs in the county that wish to be associated with the Democratic Party or use the name, “Democrat” or “Democratic”. The MCDCC has slots or positions for 23 members distributed amongst the county’s 5 Supervisorial Districts. The number of slots per district is allocated by the State Party in proportion to the number of Democrats that voted for Governor in each Supervisorial District, and thus can change after each Gubernatorial election. This and related MCDCC page is under construction and not all links may work properly. Paid for by the Mariposa County Democratic Central Committee and not authorized by any candidate or candidate's committee.